One of the cool things about the aviation community are the handful of traditions that have been passed down through the years. Breaking ground on WingSpan Aviation Center: Chandler last summer allowed me the opportunity to share a story that I’ve held as a cherished memory for many, many years. As I spoke about the project and its many benefits and economic impact on the Chandler airport community, I harkened back to my time as a pilot in training. My first solo flight was nearly 30 years ago at Falcon Field in Mesa. As you can guess I was a little nervous but managed to make a solid flight and landing. As I returned to the hangar my instructor Mike (and good friend since) cut a piece of cloth off the back of my shirt and signed it for me with the date so that I would always remember the day: October 2, 1991. He then gave it to me as a memento of that flight. That tradition comes from flying in the barnstormer days where the instructor sat directly behind the student pilot in those open two-seater planes. The instructor would tug on the back of the pilot’s shirt to indicate which direction he wanted them to turn. Once the instructor was satisfied he no longer was needed, he symbolically cut the shirt off. Much like my own story, when a young pilot soloed, his uniform tie was cut. When a student Naval Aviator makes his first catapult and landing from an aircraft carrier, the deck crew presents them with the piece of the broken hold back fitting that stays with the aircraft upon launch. When an aviator earns their wings, they retire to the club where the new wings of gold are placed at the bottom of a mug of beer. The aviator must down the mug in one go to get the wings (Now we’re talking!). 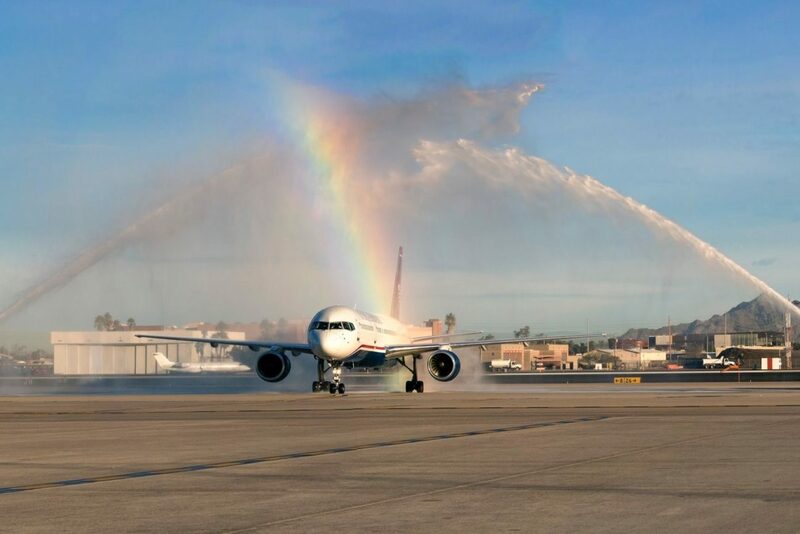 Retired airline Captain and longtime Chandler resident Bob Breidenbach talks about the water cannon salute pilots receive upon ending their last flight. As the plane returns to the gate from its flight, firefighters spray their water across the aircraft. It’s a pretty cool gesture that the passengers and flight crew really get a charge out of. Here is Bob’s salute when he retired with American Airlines a few years ago — after 38 years in the cockpit. Traditions – pilot based or otherwise – bring families, friends and co-workers closer together. They promote values and create attachments that live and carry forward for generations. It is the reason that Embry-Riddle Aeronautical University titles its alumni page “Traditions and Connections.” It is why holidays bring such significance to us. And the indelible memories these customs create bring meaning and clarity that push us forward. That old piece of cloth means the world to me. Not just for the memories of that solo flight, but for every wonderful remembrance the aviation community has provided me since.